Mark Conway and Craig Stinson were entertaining us in downtown Floyd, Virginia today because they had read in a book that if you came to Virginia, you had to visit Floyd. They are just two more of the many musicians that have been drawn to Floyd from all over the world to perform for the receptive audiences that can be found here. The streets of Floyd are definitely not paved with gold, but Floydians have good hearts and they appreciate good music. Floyd did not disappoint them as they found a ready audience on the newly constructed South Locust sidewalk. Customers of the Floyd Country Store were enjoying their ice cream treats to the toe-tapping bluegrass music when I stopped to interview them. 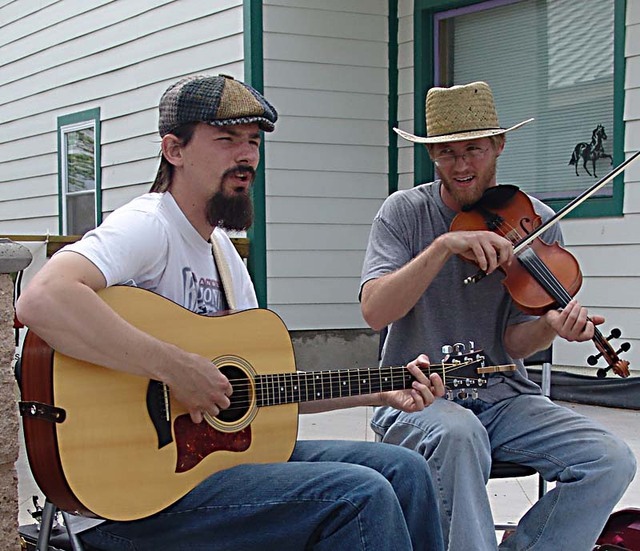 Popular local musician Bernie Coveney made them feel right at home when he stopped by for a brief discussion of their music and of the musicians they knew. Conway and Stinson plan on being in town for a few days and hope to join in the Friday Night Jamboree jam sessions at the Floyd Country Store. These young musicians are personable and I found their music appealing. 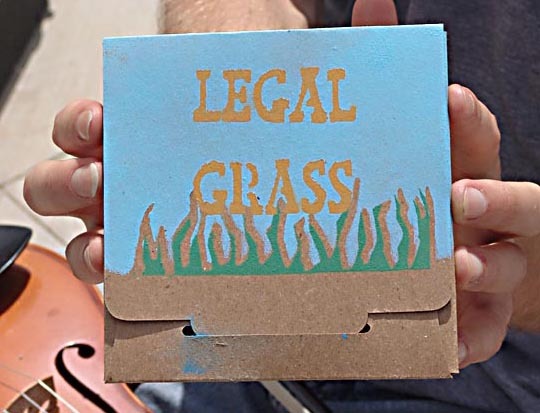 I will buy a copy of their CD "Legal Grass" before they move on. 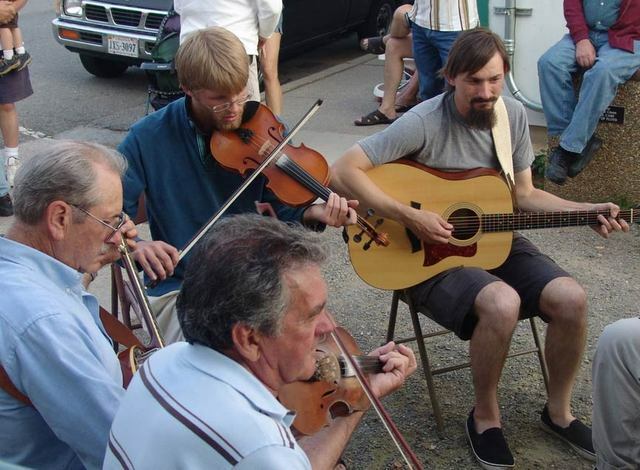 On Friday night, Mark and Craig were jamming with local musicians in the alley next to the Floyd Country Store. This was just one of several sessions they joined . It should be noted that there were many visiting musicians this particular night. 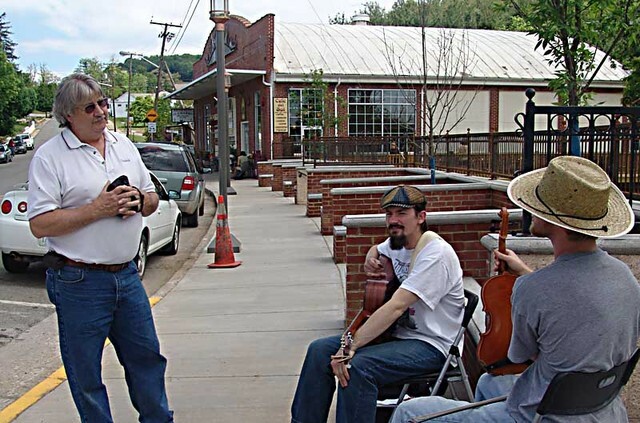 I counted at least 40 musicians playing on the sidewalks of Floyd and probably half of them were from out of the county. This entry was posted in Music, Seen around Floyd and tagged Bernie Coveney, bluegrass, Floyd Country Store, Floyd Virginia, Frank Stinson, Indianapolis bluegrass musicians, Legal Grass, Mark Conway. Bookmark the permalink.